In Chapter 4 Jesus had been in Samaria at midwinter, four months before the harvest started. Harvest is when the seed is pulled off the plant. Barley was the first crop to ripen for the harvest. In mid April the barley harvest started at the time of the feast of the Passover, the main feast. This coincided with the feast of unleavened bread that lasted seven days. In addition, the first barley to get ripe was celebrated with the feast of the firstfruits. Passover represented Christ being killed as the Lamb of God at Calvary. The firstfruits represented the resurrection where He first rose from the dead three days later, just before the Old Testament saints were harvested when they were pulled out of their graves in the earth after Christ rose from the dead. Then the harvest was finished when the Old Testament saints were pulled off the earth on the Day of Ascension when they appeared as a cloud with Him, as He went up to Heaven forty days after His resurrection. Thus the Old Testament harvest lasted about 40 days as the Old Testament saints were pulled out of the earth, and then pulled off the earth. This was the ripe harvest that Jesus saw in John Chapter 4 when He was in Samaria. The seven days of unleavened bread represented the Holy Spirit that was going to guide the church through the seven church ages. These first three feasts were close together. Fifty days later the wheat harvest started around the time of the feast of Pentecost. This represented the Day of Pentecost when the Holy Ghost filled the disciples and launched the first church age. This amazing seed of dedicated believers became the model that the last church age has to be restored back to. The seed that is reaped has to be the same as the seed that was planted. Then there was a gap of a few months and two feasts, the Trumpets and Tabernacles, happened in October together with the solemn day of Atonement. The grape harvest happened at this time. The two trumpets calling the Jews back to Israel during the Tribulation represent the two prophets Moses and Elijah. The Day of Atonement is when the 144,000 Jews meet Jesus and see the nail marks in His hands. The feast of Booths, also known as the feast of Tabernacles, represent the houses the Jews will build for themselves in the the 1000 years of peace, known as the Millennium. Winter was over and it was the time of the natural harvest, starting with the barley harvest. This feast was either the first feast of the Passover or one of the feasts that came after the Passover. Bethesda means "house of mercy". Mercy is a sign of God’s grace, which means His undeserved favour because we cannot save ourselves. Our mercy comes from the sacrifice of Jesus on the cross. Nails pierced His two hands and His two feet. A spear pierced His side. Five deep wounds. Thus five will always be the number of grace or mercy. He will carry those scars as an endless reminder to us for the price that He had to pay for our sins. Four Gospels stand around the Book of Acts. The Gospels described how Christ prepared the way for the first church to go into action, under the power of the Holy Spirit, as they spread the Good News of God’s grace and mercy to the people. Water speaks of the Word whereby God wants to cleanse the beliefs and habits of His people. The pool of Bethesda, the house of mercy, had five porches whereby one could enter the water. 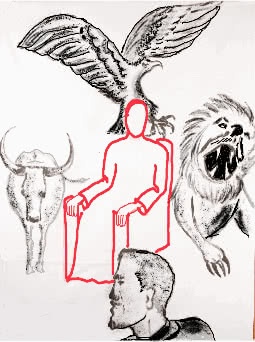 John saw four beasts or living creatures around the throne of God in Revelation Chapter 4. These five represent the power of God to sustain the church through 2000 years. The lion represents the true Word of the apostles that was sowed during the first church age. The ox represents the labour and slaughter of the church in the Dark Ages when tens of millions were killed. The man represents the wisdom of the reformers like Luther and Wesley who brought the church back to salvation by grace plus holiness and outreach that led to the missionary age. The eagle flies as the Pentecostal revival restored the supernatural gifts. But the keen eye of the eagle would also inspire an end-time prophet with an insight into the mysteries of Scripture which alone could restore the end-time believers back to the beliefs of the first church age of the apostles. These are the only five porches whereby we can approach the true Word of God to wash away our denominational unbelief. Four spiritual powers, that lead to the central power of God Who sits on His throne. Only one beast influences each church age as it guides that age towards the Throne of God. The eagle is our angel or messenger as it guides us to the restored Word of the Lion age where the truth of God started. The ox age and the man age have faded into history and no longer really affect us. They represent the growth of the church plant between the sowing and the reaping. But that has happened, and will not be repeated. Thus the focus is on the lion, the Seed Word of God that was planted by the apostles. Why is that important? Because the flying eagle represents the harvest where the Seed is pulled off the dead church plant, and taken up to heaven. The seed is only harvested when the plant is dead. So the seventh church of Laodicea is condemned in Revelation Chapter 3. The last church age of the Laodiceans dies as God vomits the church out of His mouth. This separates the church from God. Only individuals who have been restored to the first age of the apostles will be harvested as they are pulled up to heaven. "the sheep market": God regards His people as His sheep. Jesus is the Door. He is the written Word of God. Only by believing what is in the Bible can we follow Him. The four beasts around the throne were not supposed to make followers of themselves. They were supposed to guide people towards Jesus, Who sits on the throne of God. The porter is a man (an evangelist, or a preacher, or teacher) who opens the door by allowing the Shepherd (Jesus) to personally lead the sheep. The sheep never followed the porter. Human preachers bring sinners to Christ for salvation which is good. Thereafter they domineer the converts in various nice ways to get them to follow the human leader. So Christians end up belonging to a church as second hand Christians, instead of belonging to the Jesus of the Bible. The big mistake of churches is to appoint human leaders that the sheep have to follow. The only leader of the sheep is Jesus. Each person is supposed to have a personal salvation experience with Jesus whereby Jesus, as a Person, and the written Bible, as the foundation of our faith, takes first place in our lives. People can help us in our walk with the Lord, but we are never asked to follow modern day pastors or modern day churches. People can help you to follow Jesus, but must never get you to follow themselves. "Follow your pastor as he will lead you through," is not a verse that you will find anywhere in the Bible. Putting your eyes on a pastor is only possible if you take your eyes off Jesus. Following a pastor leads to spiritual disaster because you cannot defend what you believe from the Bible. You become a second-hand Christian by repeating what the pastor says and thinks, instead of just saying what the Bible says. You no longer have an opinion of your own. You have to keep thinking about what your pastor wants you to believe. The sheep, us Christians, must follow Jesus alone. Not some man. Not some pastor. There was no title of pastor in the Old Testament, and yet the prophet Jeremiah in his visions saw pastors in the future and prophesied of them when he condemned them six times. It is such a dangerous and easily corrupted ministry that the New Testament only refers to pastors once. If a pastor rules your church, please remember that you have no Bible foundation for that system. We have to follow the Scriptures as God unfolds them to us. God will only guide us by the Bible. The Bible gives a clue. A sign of the times. The word "trump" is mentioned at the time that the resurrection of the dead is mentioned. The viciously fought 2016 presidential election in America threw the name "Trump" into our faces. His abrasive leadership style has kept the name "Trump" in the headlines. Very unusually, people often referred to him as "The Trump" just the way it is written in Scripture, "the trump". So God is using him as a sign of the times. We are getting close to the resurrection. Why is Trump so important? Because in his election campaign he promised to make Jerusalem the capital of Israel. That fulfills prophecy. Fulfilling prophecy is more important than anything else. Even more important than people liking the person fulfilling it. Where did message pastors go wrong when they claimed that Trump would lose the election? They interpreted a quote of a woman ruling America to mean Hillary would win the election. This was the classic showdown: a written Scripture versus an interpreted quote. The message pastors got it completely wrong, which means they are totally out of tune with God’s thinking. But gullible message people will continue to follow them and their interpretation of quotes that contradict Scripture, because neither the people nor the pastors know how to interpret Scripture. "The pastor is the head of the church." There is no such Scripture. These so-called "heads of the church" (reminds one of the seven headed beast in Revelation 13) got the American election completely wrong. Not to mention that these pastors disagree with each other on other topics. Now a so-called message person has to believe in whatever the message church they belong to happens to believe. The different pastors peer dimly through a fog of personal opinion that is removed from Scripture. Belief depends on geography. Whatever they preach in your part of the world, you have to believe. Move around and your beliefs have to change too because pastors in different places believe differently. But wherever you end up, that pastor expects you to conform to his beliefs. The blind lead the blind. The Tribulation is the ditch that is waiting for anyone who believes something that is not in the Bible. Flee from any pastor or preacher or person that does not speak from the written Word of God. A preacher is supposed to get you to believe only what is written in Scripture. Only the written King James Version of the Bible is the "Voice of God". We were never promised the Voice of God at the end time, only the voice of the seventh angel with his shout, as he finishes the mystery of God by restoring us back to the apostolic fathers of the New Testament. So if you are desperate to follow a man, follow Saint Paul and believe what he wrote in the New Testament. Paul agrees with what the other apostles wrote. And if you start following those original apostles from the first church age, you will find that they keep pointing you to Christ, not to themselves. As you follow Jesus through the pages of the Bible, you will find direction in our troubled age. Otherwise you will just drift and be overtaken by events. Trinity, Christmas, denominations, God the Son, One God in three Persons, William Branham is our Absolute.These are expressions that are not found in the Bible. What the seven Thunders utter were not written in the Bible, and thus cannot be known by us before the resurrection of the dead happens. The new name of Jesus is not known by any man. All of these ideas are not written in the Bible, but are widely believed. Message pastors claim that they know this new name. And people are foolish enough to believe them despite the Bible saying that no man knew the name. Church leaders who speak on these topics are just misleading other people. 10:7 is interesting. The 10th day of the 7th month was the only time that the high priest could enter into the mysteries that lay behind the veil in the Temple. On this Day of Atonement, only one man could look beyond the veil to catch a revelation of what God was doing behind the veil. 10:7 appears in the Book of Revelation. REVELATION 10:7 But in the days of the voice of the seventh angel, when he shall begin to sound, the mystery of God should be finished. 10:7 is thus also linked to the open door of the revelation of the mysteries of the Bible. A series of visions in 1963, brought to him by seven angels, allowed the end-time prophet to see beyond the veil (curtain) of time, and thereby catch the revelation of the opening of the seven Seals. This future event of opening the seven Seals will only happen after the Bride has been caught up to Heaven. But by seeing the event in advance, the prophet could return to our time and reveal the mysteries of Scripture which will make it possible for us to read the Bible and understand it, just the way the first church age understood it. When the seventh church age believes exactly what the first church age believed, then the mystery of God will be finished and the Lord will come. Spiritually this symbolized the state of the Jews in Jesus’ day. It even matches God’s opinion of the church of the Laodiceans in our seventh church age, which He also describes as blind. Just before the second Coming the church is in the same dismal state that the Jews were in at the time of the first Coming of Jesus. From the perspective of the seven church ages there were seven porters who opened the door so that the sheep could follow the Shepherd, Jesus, as He was revealed to them in their age by the Scriptures. Each church age had an angel (messenger) who briefly stirred up the Word of God. Luther stirred up salvation by grace through faith. Wesley stirred up holiness and outreach. The most gifted Pentecostal preacher who stirred up the supernatural was William Branham who then, in addition, stirred up the revelation of the mysteries of Scripture. But each age faded as the waters subsided because each age then began either following the messenger or some other human church leader. The point of each messenger was to get people turned towards following Jesus and the Bible more closely. But second-hand Christians found it easier to follow human leaders, as if they were scrapped vehicles being towed to a junk yard. People stopped thinking for themselves, followed their human leaders, and just parroted the approved quotes. From the Jewish standpoint at the first Coming of Jesus, this incident at the pool symbolized their journey in the first exodus to the Promised Land. Why was he sick for 38 years? He represented the Jewish nation under Moses, who got to Kadesh Barnea on the border of the Promised Land, and then made the fateful decision that they were not strong enough to conquer the giants in the Promised Land. They forgot that God was going to fight the battles for them. So God made them wander in the wilderness for 38 years until they died off. Then their children would be allowed to go in and occupy the land, starting at the brook Zered. DEUTERONOMY 2:14 And the space in which we came from Kadesh-barnea, until we were come over the brook Zered, was thirty and eight years; until all the generation of the men of war were wasted out from among the host, as the LORD sware unto them. :15 For indeed the hand of the LORD was against them, to destroy them from among the host, until they were consumed. The Jews were helpless in the wilderness for that 38 years as they marched around getting nowhere. Christians attend church for decades, and know very little more at the end than what they knew a few years after joining the church. The man's condition represented the 38 years that the Jews wasted in the wilderness. "Joining a church" or "Which church do you belong to?" are not Scriptural statements. This man had no human who could help him and lead him to the pool, just like the Jews in the wilderness. Even their great leader Moses could not lead them into the Promised Land. Moses represented the Law, and Joshua represented grace. A change of leadership was needed to take the Jews into Israel. This man now found His true Leader, Jesus. With his eyes on Jesus and not following any other man or relying on the help of any other man, the man was changed and healed. His 38 years of wasted life were over. Joshua got the priests to carry the ark as a symbol of God’s power on their shoulders as they entered the Promised Land. Jesus got this healed man to carry his sick bed on his shoulder as a symbol of God’s power over sickness. The Sabbath for the Jews was the day of rest from work, on Saturday. This represents the Holy Ghost baptism, which makes us rest from our sins and unbelief in Scripture. After resting, God never went back to His creative works again. But resting on Saturday and then going back to work the next day was not resting like God did. However, receiving the Holy Ghost makes us cease from our sinful works like stealing, telling lies, smoking, drinking, telling dirty jokes etc. and we never go back to those sinful works again. So the Holy Ghost baptism is the true rest. Sabbath means rest. The Holy Ghost makes us rest from sin. The Holy Ghost baptism is when a portion of the Spirit of God comes into a person and controls their life. That experience makes the person a follower of Jesus and the Scripture. The seventh day of God is the 1000 years of rest that comes after Armageddon. Then we will see His real power. By objecting that this healing was doing work, the Jews were hypocritical because their animals had to be led to water on the Sabbath day. And if they saw a sick animal, they would attend to it on a Sabbath day. If an animal fell into a pit, they would not just leave it there for the Sabbath. They would pull it out. Truth is written in the Bible. But the Devil does not want people to just follow Jesus. He makes the people desire a human leader just like when the Jews demanded to have Saul as a king that they could follow a man. II KINGS 25:13 And the pillars of brass that were in the house of the LORD, and the bases, and the brasen sea that was in the house of the LORD, did the Chaldees break in pieces, and carried the brass of them to Babylon. Babylon broke up the Temple pool, or huge brass laver that was called the brasen sea, and carried it away. So Christians get fooled into breaking up God’s plan by following their church leaders in different directions, as each denomination or church has different beliefs. Meanwhile Jesus used the pool to make a man whole and he had to carry what was a sickbed as a sign of his healing and more importantly, as a reward for following Jesus for himself without being told what to do by human church leaders, who disagree with each other anyway. :26 And also unto the Levites; they shall no more carry the tabernacle, nor any vessels of it for the service thereof. Once the Jews were in Jerusalem, they had rest in the days of Solomon, who was the son of David. His reign was a preview of the 1000 years of peace, also known as the "Millennium". A bed is originally meant for rest. We use a bed for sickness if we have to. Jesus had now turned the sickbed back into its proper use, simply a bed to rest on. This showed His power to restore. By carrying his bed, the healed man was symbolically carrying his rest. Sickness and death confine us to a bed. Carrying a sickbed is a triumph over the effects of sin. The resurrection from the dead is the final triumph over the effects of sin. :12 Then asked they him, What man is that which said unto thee, Take up thy bed, and walk? :13 And he that was healed wist not who it was: for Jesus had conveyed himself away, a multitude being in that place. Jesus sought no fame from this miracle. Unlike modern day pastors who rush to the websites to proclaim to the world what they have done, in this age of competitive Christianity. Jesus now reminded the man that there was a deeper issue at stake. Having met Jesus, the man must not return to a sinful lifestyle again. Sabbath -- "sin no more": The Holy Ghost to make us cease from sin. To cease from sin was more important than the healing power. The healed person will ultimately die. Free from sin we gain eternal life. Jerusalem was the headquarters of the Jewish religion. These Jews were so influenced by their religious leaders that they could not appreciate the power of Jesus to heal. He thereby completely outperformed their religious leaders who became insanely jealous. Each Jew thought that his religious leader was the greatest, and now an outsider was out-performing them all. The Jews could not handle it that God was moving outside their religious groups. Like today's Christians who seriously think that God is mainly focused on their church, even though there are 45,000 different kinds of denominational churches. So they classified a healing as "work", and then used this description of healing to ban any healing on a Saturday Sabbath. Their main problem was being shown up as inferior, because none of the Jews could perform a healing -- only God could do it. That meant that Jesus had more contact with God than their own religious leaders. And on a Saturday Sabbath the priests and the Levites had to work hard in the Temple to conduct the religious ceremonies. And Jesus was the Messiah, Emmanuel (meaning "God with us"). That made Him the true High Priest. They overlooked the fact that farmers had to water their animals on a Saturday. If an ox fell into a pit they would get it out on a Saturday. But healing a person was not allowed. They were desperate to find fault with Jesus. Virtually every Christian today wrongly claims that there are mistakes in the King James Version of the Bible. And Jesus is the Word. So modern day Christians are still faulting Jesus. By His healing power He showed that God was with Him in a way that their priests could not compare. Insane religious jealousy made them make up their own unscriptural rules and then condemn anyone who disagreed with their unscriptural rules. Especially if that person could out-perform them. Much like today’s church systems. Each pastor has a strict rule, "You are only allowed to believe my opinion". Thus Jesus, by being Scriptural, became the great enemy of human religious leadership. People cannot believe that Jesus really is God. God had to be in Him. No man could do what He was doing. It had to be God in Him that had that power. The ability of Jesus to perform the supernatural should have made the Jews realize Who He was. Jesus was able to raise the dead. More important, He was able to inspire faith in spiritually dead people and make people believe in God and give them a desire to work for God. God the Father is not the Judge. Judgement Day will see the Son of God, Jesus, being the supreme Judge. Jesus becomes the perfect blend of God’s strict justice and truth, with the human need of mercy and forgiveness. Jesus was God on the inside and Man on the outside, so He is the only intercessor Who understands both man and God. Ultimately we will be judged by what is written in the Bible. Jesus is the Word of God. So Jesus will be the Judge. The prophet Daniel saw what looked like two People at Judgement Day. The Ancient of Days had white hair which was the woolen wig of a judge. Long hair is a symbol of submission, symbolizing that the Judge is under submission to the Word of God. The Ancient of Days cannot be God the Father because the Father judges no man. In Revelation, John sees Jesus with the white woolen wig of a Judge. The vision in Daniel is called "personification". The qualities of a Judge, mercy and truth, are illustrated as if truth and mercy are two separate people. But both these qualities meet in Jesus. As Son of man He is a fellow human being who wants to exhibit mercy towards us, but as the Ancient of Days (Jesus has been around since the beginning) He has to judge strictly by God’s Word which is the Truth. He is thus the only One Who can display mercy and truth. PSALM 85:10 Mercy and truth are met together. The Son is the Man that God the Father, Who is a Spirit, lives in. Rejecting Jesus makes you reject the God that is in Him. Jesus would win our salvation from sin at Calvary, according to His Scriptural plan. Since we cannot save ourselves, it is essential that we believe and follow the Scriptures as they are the only way to Heaven. The first resurrection was about to occur when the Old Testament saints would rise from the dead. When Jesus died He carried our sins down to hell and then dumped them on the Devil. On His way up He called in at the Old Testament paradise, and then raised all these Old Testament saints from the dead in a resurrection that happened soon after His own resurrection. The resurrection is the ultimate proof that God has the power of life over death. Again it is emphasized that Jesus is the Judge. Ancient of Days means He has been around a long time and has wisdom. You cannot fool Him. Son of man means He is also human, He understands us. Wise and understanding, that makes Him the ideal Judge. The believers from the Old Testament would soon rise from the dead after His resurrection and ascend with Him to Heaven as a cloud (of witnesses). The two resurrections are separated by 3000 years. The resurrection of life happened shortly after the resurrection of Jesus. At the end of the 2000 years of the church ages will come the 1000 years of peace, and then there will come the general resurrection from the dead. Then the unbelievers from the Old Testament, as well as from the seven church ages, will rise to be condemned. People obviously feel that one verse cannot describe two events separated by thousands of years. But we find more verses in the Scriptures that illustrate this. For example, Jesus read from the prophet Isaiah Chapter 61:1-2. ISAIAH 61:2 To proclaim the acceptable year of the LORD, and the day of vengeance of our God. The acceptable year referred to His first Coming. The day of vengeance of our God, which is the second part of the verse that Jesus did not read, refers to the great Tribulation that was to come 2000 years later. The secret of the success of Jesus is that He never sought His own will. That is the example that we are to follow. Jesus was only fully concerned with the will of God because the fullness of God lived in Him bodily. If a portion of the Spirit of God dwells in us, then we too will only be interested in the will of God. Our own self-will then just fades into insignificance. We are not supposed to emphasize ourselves. We are not supposed to draw attention to ourselves. John the Baptist, a mighty prophet, had already borne witness of Jesus. But Jesus did not need to gain the approval of any man. Acceptance by human leaders is not part of God’s plan. Now Jesus was trying to warn them of the big mistake people make when they meet a prophet. Especially the spirit of Elijah that was to come before the first Coming of Jesus. This spirit of Elijah was in John the Baptist. But the followers of John needed to be saved from a bad mistake that they made. (The same bad mistake that the followers of William Branham will make just before the second Coming). John the Baptist was head and shoulders above the preachers of his day. He was brilliant, and his followers were fascinated with the light that he shone into the spiritual darkness of his day. So John’s followers kept rejoicing in his light. It became all about the man John. They just followed John. In their exalting of John they missed what John was pointing to, which was that they should follow Jesus. :36 And looking upon Jesus as he walked, he saith, Behold the Lamb of God! :37 And the two disciples heard him speak, and they followed Jesus. Jesus was far more important than John. One of these disciples was Andrew. Andrew was the only disciple of John the Baptist who became a disciple of Jesus and an apostle. John was to point out Jesus as a Man walking amongst men. Then those who heard John speak, and understood what John was saying, would follow Jesus. Those who heard John speak had to understand what he was getting at. They proved that by following Jesus. They realized that Jesus was far more important than John. At the end-time William Branham had to reveal Jesus walking through the pages of His Word. Those who understood what brother Branham was saying, would then follow Jesus through the Bible by only basing their beliefs on what is written in Scripture. But as with John the Baptist, very few disciples of William Branham will become disciples of Jesus, the revealed Word. We were not promised the Voice of God at the end time. We cannot see what God looks like. Jesus always referred to the Scriptures that He had fulfilled as His proof that God had sent Him. The only proof of our relationship with God is our obedience to the written Word of God as proof that we can understand the Bible. If we have little revelation, we have little understanding of Scripture. Little understanding of how Jesus thinks. We must just stay in Scripture, and read the Scripture with understanding, instead of trying to twist quotes into various speculations. The various interpretations of the quotes do not abide in the Word. The conclusions drawn from selected quotes are just as unscriptural as trinity is. We are told to search the Scriptures. Notice these unscriptural statements made by message people"
"I am in the message" or "I am a message believer". "The sermons of brother Branham are the 'Voice of God'." "You can only be saved if you are in the message"
"The pastor is the head of the church"
"The tithes belong to the pastor"
"You cannot judge the prophet"
"A woman will rule America, so Hillary will win the 2016 Presidential election in America". None of these statements are Scriptural. Trump winning the election showed how far out of tune with God the message pastors had got. Christians refuse to build their beliefs on Scripture because they do not know the Scripture. There is too much to read. The Bible is a thick book. There are too many difficult passages to puzzle out. It is just too much hard work. So joining and splicing quotes together is much easier. Church people are so scared of disagreeing with their pastor. Disagree with the pastor, and both he and the people in that church shun you. If you stand for Bible truth you will receive no honour from the church-goers. But the pastors have so many disagreements amongst themselves. There is no return to Scripture which could unify their beliefs. Pastors do not link the Scriptures together in order to prove their beliefs. People anxiously seek the approval of the pastors by agreeing with them. They are so desperate for this approval that they willingly condemn anyone who disagrees with the pastor. Love requires hard work. If we love God we have to be interested in all His Scripture. We cannot say that there are mistakes and contradictions in the King James Version of the Bible. We have to wrestle with the difficult passages to learn their deeper truths. Only the love of God can inspire us to constantly search the Scriptures without dismissing any parts as being irrelevant or less important. We love human names. We exalt human church leaders. But if a man just strictly stays with Scripture, we reject him. Church people exalt their leaders who bask in this intoxicating honour and boost to their self-importance. Church-goers desperately agree with their church leaders so that these leaders will honour them for their loyalty and obedience. The Jews had the same problem back then. They desperately wanted to agree with their religious leaders. Their leaders wanted to be elevated above the people, and held in high esteem and honour. Ego massaging always accompanies self-importance. People honoured the leaders for their own self-gain. They have this desperate need to be part of a religious group which they feel, and think, is essential for their salvation. The Jews thought they would be saved by idolizing the prophet Moses. That same Moses is going to condemn them. The Jews used the Sabbath day of Moses to condemn Jesus for healing on a Saturday. Yet the very Law of Moses required the Priests and Levites to work hard during the ceremonial Sabbath worship in the Temple. And Jesus was the true High Priest of the Jews. Message people who follow the end-time prophet, and interpret his quotes into a belief that cannot be proven from Scripture, will be condemned by brother Branham because he told them to prove his quotes from Scripture. He never wanted his quotes to replace Scripture as their function was to reveal Scripture. Moses wrote of a prophet Who was to come. The supernatural power of Jesus made Him the obvious prophet to follow Moses. Moses had said that this great Prophet would have much to tell the Jews. So they should have listened. Moses introduced them to the innocent Passover Lamb. Jesus was the innocent Passover Lamb. Moses washed Aaron and then anointed him as high priest. John the Baptist washed Jesus in the river Jordan, and then watched as the Holy Spirit came down like a dove to publicly anoint Him as High Priest. The Jews claimed to follow Moses, but they just selected certain of his statements to believe. They then twisted up a lot of man-made statements which they regarded as the so-called laws of the Sabbath. They missed the important point -- that Jesus actually did what was written of Him in Scripture. Putting Pharisees and Sadducees in charge of Jewish worshipers was wrong, as these human religious leaders just made up even more unscriptural ideas that the Jews had to believe. The Jews did not want to believe certain things that Moses wrote, because it did not agree with their unscriptural synagogues, and Pharisees and Sadducees, which they had invented in Babylon when they were in captivity. They preferred what their religious leaders said, and ignored much of what was written in the Old Testament. Once you listen to religious leaders, you start drifting away from Scripture as you follow their opinions. Thus they rejected Jesus because He was the true Word of God. Christians reject portions of the Bible today because the Bible does not speak of Christmas, nor of celebrating Christ’s birth, nor 25 December nor Christmas trees etc. But Christians want to have this big festival. They want to serve God their way, not the Bible way. Just point out that 25 December was the birthday of the pagan sun god and you will see how unpopular you are. "The Cloud of 1963 was the mighty Angel of Revelation Chapter 10 coming down". "The mighty Angel of Revelation Chapter 10 must come down when William Branham is on earth". "The seven Seals of Revelation Chapter 6 have already been opened". "We know the new name of the Lord". Getting involved in these kinds of doctrines means that you will never follow brother Branham’s quotes through the Scripture, as all the above interpretations are unscriptural. So by stressing the quotes of the prophet, message people have become unscriptural. Jesus cannot find message churches who believe His words that are written in the Bible. Thus Jesus, as the Word, is forced today to stand outside the church in the Laodicean church age. Just like the Jews rejected Jesus in the judgement hall of Pontius Pilate. People want the quotes of religious leaders -- they do not want the actual Word of God.